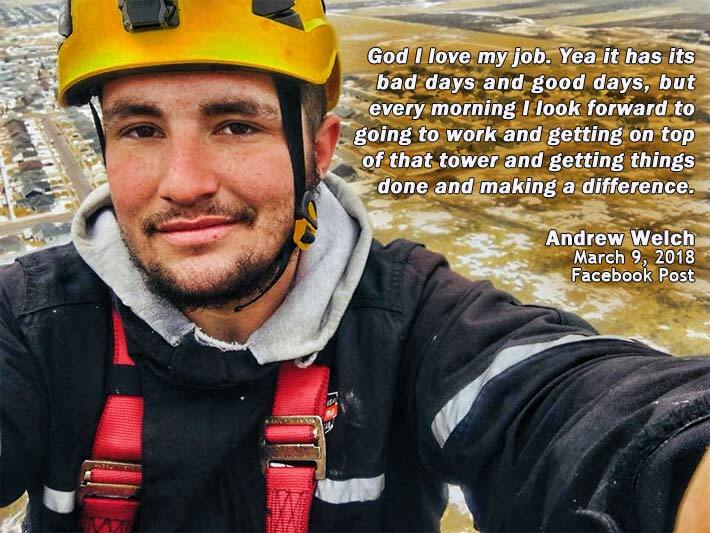 South Dakota authorities said that Andrew Michael Psomas died on Jan. 10, 2019 after falling off a tower from an unknown height. He had a Facebook page under the name of Andrew Welch. Welch is his mother Beth’s maiden name. UPDATE: January 18, 2019 – According to two individuals that are familiar with Andrew Psomas’ fall from a tower on Jan. 10 that took his life, the three-man tower crew he was assigned to was performing tiger team warranty work for AT&T on the 190-foot self-supporting tower. Psomas was reportedly at the 150-foot level when he fell. It is not known whether he was tied off or if there was a harness or safety climb failure. Psomas’ harness and the structure is being investigated by OSHA. Upon arrival at the site the crew reportedly did not contact Crown Castle’s NOC. Crown Castle did not return a request for information from Wireless Estimator regarding the fatality. No information is being provided by Psomas’ employer or others as to whether the crew, which had one green hand, took measures to identify hazards associated with a night climb. Sunset in Pennington County was at about 4:40 p.m. The accident occurred about four hours later. Psomas’ mother and step-father are expected to fly home from South Dakota tomorrow after making service arrangements for their son. January 15, 2019 – South Dakota authorities have informed Wireless Estimator that a 23-year-old tower technician fell to his death from a cell tower on Thurs., Jan. 10, 2019 and was pronounced dead at the scene. A Pennington County Sheriff’s spokesperson said that the deceased worker was Andrew Michael Psomas. They did not have readily available his home address. Psomas, who made his first climb on Jan. 19, 2018, according to his Facebook page, was employed by True North Tower of Sauk Rapids, MN when the accident happened. According to authorities, a call for emergency assistance came in at 8:44 p.m. It is unknown at what height Psomas was at on the 190-foot Crown Castle self-supporting tower when he fell. Temperatures at 9:00 p.m. hovered around 39 degrees F.
The structure is located on 154th Ave. near Caputa, a small rural community of 173 residents. “ We are deeply saddened by this tragic event and our thoughts are with Andrew’s family, friends and co-workers as we work through this difficult time,” a spokesperson from True North Tower said. “At this very early stage of the investigation, we have no further details other than what has been reported by local authorities. We are in the process of working with local agencies, including OSHA, to conduct a thorough investigation of the circumstances surrounding this event. This is a very difficult time for all involved and we ask that you respect the privacy of those involved to preserve dignity,” he said. According to friends of Psomas, he was not married. Psomas was the first tower technician to die in 2019 in a work-related accident.